Once a repair or installation has been carried out on an air-conditioning or refrigeration system, you will be ready to evacuate the system in preparation for the charging of refrigerant. Although a common practice within the HVAC industry, there can be times when engineers can be confused as to what the best approach is due to conflicting advice and unclarity with some of the instructions they’ve been given in the past. There can also be factors to consider should the initial evacuation run into problems. Although the process is straightforward, any uncertainty could mean more time being invested into the procedure. Regardless of whether you’re new to the industry or looking for a refresher course, the following guide will ensure that the evacuation of a HVAC unit is carried out in the right way. Checking you have access to the right equipment is an integral part of the process. Those who overlook this process run the risk of not having the right tools on hand at the right time, which makes an effective evacuation difficult. Vacuum Gauge: A digital gauge will offer more accuracy than a dial gauge, but either is better than none. There is a choice of digital vacuum gauges available, such as the Acravac Plus and the BluVac. If your budget is less, then it’s important to invest in a quality dial vacuum gauge. 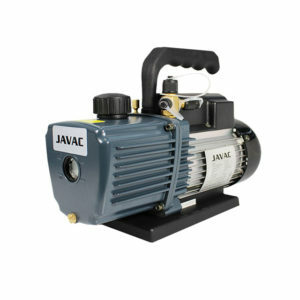 Vacuum Pump: The pump used will depend on several different factors. This can include the size of the application, and whether you decide to use a two-stage pump. How much you pay will depend on the pump your purchase, but it’s important to source tools from a reputable supplier. . Vacuum Hoses: The vacuum hoses you use need to be rated to 30 microns or below Most of the gauges and hoses are only suitable for charging, meaning they can’t be used to obtain a deep vacuum. Vacuum Pump Oil: Although a good quality pump can be relied on, there’s certainly no harm in making sure there is some oil to hand to ensure the pump is working at its best. Nitrogen: Necessary to ensure that there is flow generated and less moisture. Carrying out a refrigeration evacuation starts with the removal of the valve cores. From here, the vacuum hoses are connected to the vacuum pump. To ensure a healthy vacuum is present, it’s important to use hoses that are 3/8 or ½ inch in size. It’s now time to attach the vacuum gauge, which should be connected a far distance from the pump. The vacuum gauge is the ideal way of finding a leak. If the system does have a lean that the gauge will continue to rise. If no leak is present, there will be a cut off once the vapour pressure balances out within the application. A deep vacuum will require a vacuum pull of 500 microns or below. A vacuum pull of less than 200 microns will often ensure that there is no moisture within the application. The first standing test requires a vacuum pull of 1000 microns. The vacuum then needs to be isolated with the core tools as the pump continues to run. The leak rate will then be determined by a drop in vacuum over a period of time. Should the pressure spike, the this could mean that there is still moisture in the system, or a leak is present. The core tools need to be opened so the system can continue with the evacuation process. Once the vacuum level is 500 microns or less, the initial standing test needs to be carried out again. The leak rate of the second standing test should be significantly lower than that of the original test. This shows engineers that the dehydration process is being carried out effectively. If a leak is found, it will need to be fixed before any evacuation can take place. Once the second standing test has been completed, the vacuum pump should be run until a level of below 200 microns. The vacuum rig then needs to be isolated using the core tools and then needs to stand for around 30 minutes. If the micron level doesn’t rise above 500 microns, then the process is complete. If the pressure does rise above 500 microns, then the core tools will need to be opened again for the evacuation to be completed. How Long Should It Take to Evacuate a System? Those new to the industry will want to ensure that they’re remaining productive as possible, which means knowing how long each evacuation should take. There is some advice available, such as allowing for a ten-minute window with a minute added per ton. Other factors that come into play will include the condition of the equipment being used, whether any problems are present and the type of application you’re dealing with. The fact of the matter is that there is no real way of knowing exactly how long an evacuation will take, but it’s vital that no shortcuts are taken. Using a reputable supplier for your evacuation equipment and oil will ensure that you’re not ill-prepared for an evacuation, meaning that the process will be much quicker. If you’re new to the industry or looking to update your current tools to something more reliable, then why not browse the extensive range of pumps and paraphernalia available at HVACTOOLS. As well as having a vast amount of choice, customers can also be confident that the products on sale have been put through rigorous testing.